A bad case of sunburn can be extremely painful and definitely ruin a weekend break in the sun. This pack contains a 75ml can SPF 30 Techniblock Sunscreen, 75ml SPF 50 Anti-Ageing Sunscreen for the face, SPF 20 lip balm and an 85ml can of Peaceful Sleep insect repellent. This handy sunscreen travel pack provides great protection for a short break in the sunshine and if you're travelling hand luggage only, all the products in this pack are under 100ml so there's no problem with popping them in your carry-on bags. Peaceful Sleep is a clean and highly effective repellent against midges, flies and mosquitoes and one of our best-selling products. 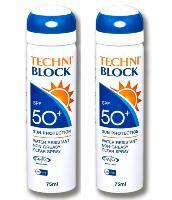 Apply Techniblock once for high quality, long lasting protection against harmful UV rays. Delivered in a cool, clear lightweight spray that is instantly absorbed, leaving behind just what's needed to keep skin sunburn free, this transparent, very water and sweat resistant sunscreen is easy to apply and comfortable to wear. 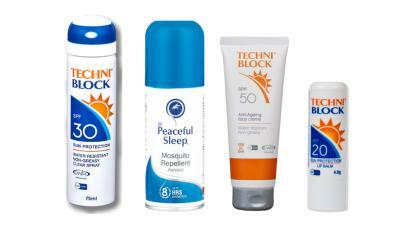 With no oils, emulsifiers or perfume, Techniblock is an ideal solution for sensitive skin prone to prickly heat rash and it's non-sticky, non-greasy feel will keep you cool and fresh, allowing skin to breathe, whether you're sightseeing, lying on the beach or resting by the pool. The SPF 50 Anti-Ageing face cream is light and non-greasy and a little goes a long way! It's non-comedogenic which makes it very suitable for sensitive skin prone to breakouts and the lip balm will soothe and protect and keep your lips soft, moisturised and protected. The sealed, leak-proof can and twist-top locking cap ensures no messy spills. Great for hand luggage only trips!